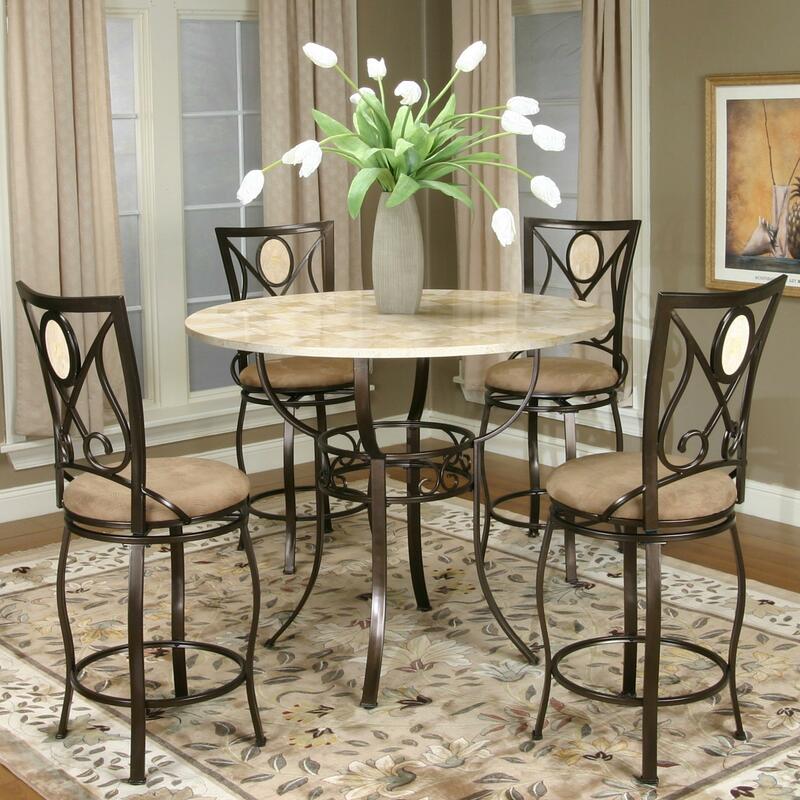 Curvaceous metal bases are decorated in scrolled cut-outs and a warm finish in the Five Piece Pub Table Set. The Nadia Collection Pub Table base supports a round marble inlaid top. 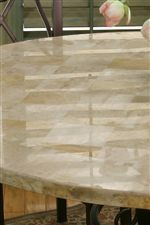 Marble is patterned into checkered detail across the table top for a dimensional allure. Make this counter height table a family dinner destination or use it for cocktail hour. 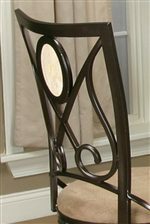 A sleek metal frame is curved into the Nadia Swivel Counter Stool. This motion stool's seat is upholstered with a modest fabric that matches any dining room decor. The dark frame finish creates a warming allure that gives the scrolled back detail a charming glow. 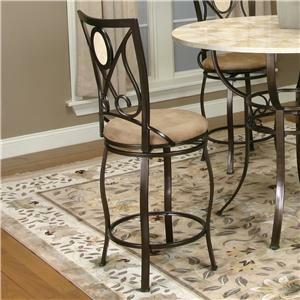 A small marble inlay in the stool back gives the Counter Stool a fresh design. 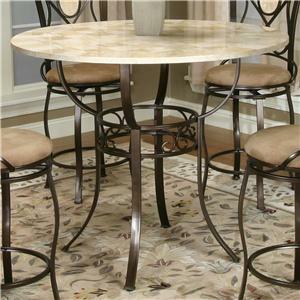 The Nadia Five Piece Pub Table Set's juxtaposition of fabric, metal, and marble makes it undeniably desirable. The Cramco Trading Company - Nadia Five Piece Pub Table and Swivel Stool Set by Cramco, Inc at Value City Furniture in the New Jersey, NJ, Staten Island, Hoboken area. Product availability may vary. Contact us for the most current availability on this product. Case Construction Crafted from Marble and Metals. All Items are Constructed Using the Highest-Grade Components to Insure Years of Service and Durability. Marble, fabric, and metal mix together to create the attractive dining pieces in the Nadia Collection. Pedestal style bases, curvaceous silhouettes, and scrolled cut-out designs give this collection of dining room furniture a modern appeal in a more casual style. The dining table and counter height sets are ideal for a smaller space and offer plenty of leg room. Make the most of your home with the Nadia Collection's handsome counter height pieces. The Cramco Trading Company - Nadia collection is a great option if you are looking for Transitional furniture in the New Jersey, NJ, Staten Island, Hoboken area. Browse other items in the Cramco Trading Company - Nadia collection from Value City Furniture in the New Jersey, NJ, Staten Island, Hoboken area.